EASTERN EAST PACIFIC NUMBER 2 IN-THE-MAKING? A few days ago when reporting on the first-named tropical cyclone of the 2014 East Pacific Hurricane Season, Hurricane AMANDA, we also noticed a large region of disturbed weather ‘chasing’ Amanda off the Pacific coastline from southern Mexico, to Central America and Panama, which was populated by several cells of stormy and disturbed weather. 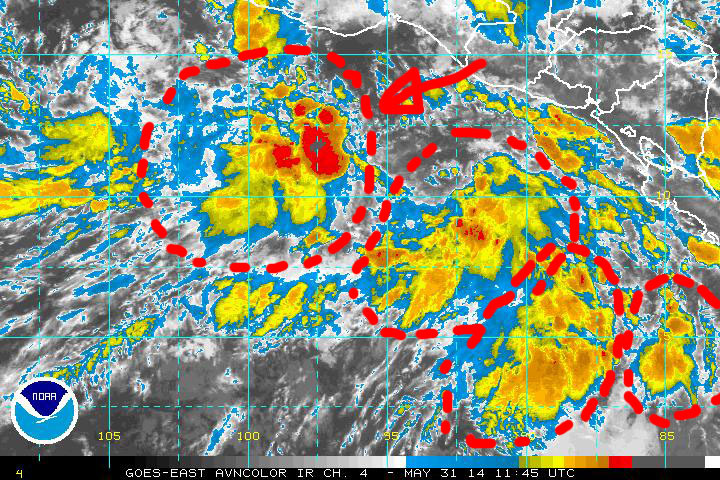 As of Friday 30 May 2014 one of those stormy weather cells near the Gulf of Tehuantepec, in southern Mexico, has gotten quiet organized and it is showing signs of potential cyclonic development to the point that the National Hurricane Center (NHC) is giving it a moderate 30% of tropical cyclone development over the next 24 – 36 hours as it continues moving into a favorable atmospheric-oceanic environment. Could this be the genesis of the number two named storm of the 2014 East Pacific hurricane season? Both NOAA and NASA satellite imagery on 31 May 2014 certainly show an active region of disturbed weather off the Pacific coastline of Mexico, Central America and Panama that warrants close monitoring over the next couple of days.